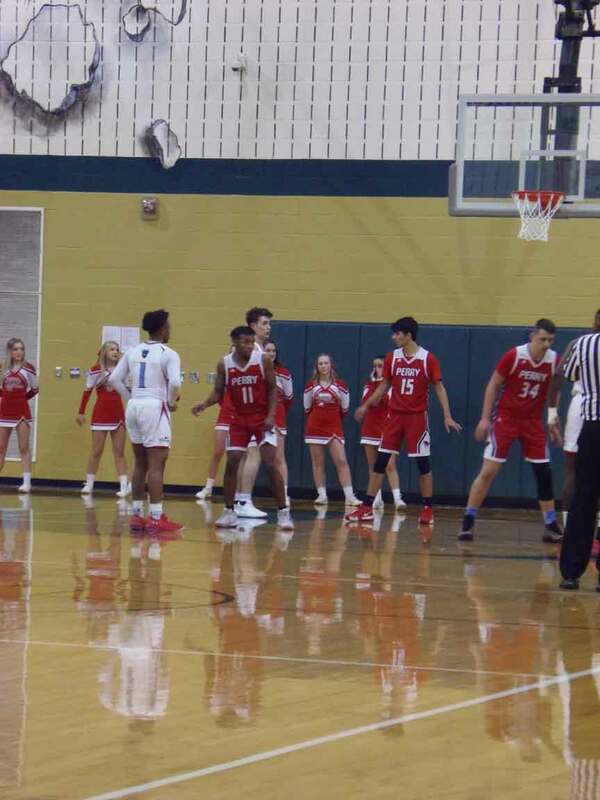 ASHTABULA – The Perry Pirates boys’ basketball team was unable to hold off a second half charge from the Villa Angela-St. Joseph Vikings in a recent division II district semifinal game. Perry held a 36-32 lead at the break, but VASJ turned a four point deficit into a four point lead after three quarters of play. The Vikings went on to win the game 59-54 after a low scoring fourth quarter by both teams. Perry outscored VASJ 17-14 in the opening quarter. Jaylen Anderson paced the Pirates with seven points. Nate Cubbison added a three pointer, Jake Reid hit three free throws and Matt Cool and Jordan Anderson each added a bucket. Graham Koppelman and Jordan Calhoun kept the Vikings close in the opening quarter as they each hit on a three-pointer. Jaden Hameed, Jason Priah, Khalil Mitcham and Jonah Waag each added a basket. The Pirates went on to outscore VASJ 19-18 in the second quarter. Graham Koppelman provided much of the fire power for the Vikings with 11 of their 18 points. Drew Schiano led the Pirates with nine points. Jake Reid and Nate Cubbison each added a three-pointer for Perry. The Vikings turned things around in the third quarter behind Jaden Hameed. Hameed led VASJ with nine points in the quarter. Drew Schiano again led the Pirates with four points. VASJ took a 49-45 lead into the fourth quarter. The Vikings would receive baskets from Jonah Waag, Khalil Mitchem, Jordan Calhoun and Jason Priah in the fourth quarter. Hameed was also able to hit on a pair of free throws to help ice the game. Drew Schiano added four more points in the loss for Perry to finish with a game high 17 points. Nate Cubbison finished with 12 points for the Pirates and Jaylen Anderson also finished in double digits with ten points. Graham Koppelman led the Vikings with 14 points. Jaden Hameed finished the game with 13 points. Khalil Mitcham also scored in double digits with ten points. With the win the Vikings advanced to play the Geneva Eagles in the district championship game. Pictured: The Perry Pirates play defense against the VASJ Vikings during a recent district tournament basketball game.